DevOps and Enterprise Agile frameworks are key enablers of Digital Transformations at the operating level of organizations, but to achieve true agility across the enterprise, these principles must become the norm in all business areas. 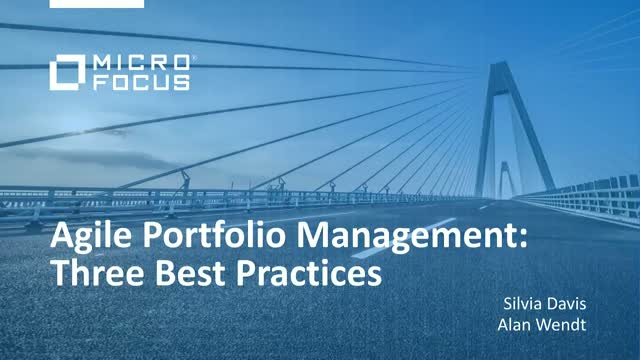 Some of the most critical connection functions in the organization are Portfolio Management, Program Management, and Project Delivery. This presentation will offer three best practices for Agile Project and Portfolio management to help your organization succeed in this transformational era. As organizations go through a digital transformation, they must remain competitive by delivering value faster, while maintaining high quality and security. This webinar will explore how organizations can minimize risk and maximize user satisfaction by testing early and often, from development through to production, and acting on feedback on security, functionality, performance, and readiness status. Organizations of every size and industry are going through a digital transformation to adapt to new technologies and ways of doing business. A recent survey conducted by IDC across 420 large European organizations shows that a sure way to gain both business and technology benefits is to scale up existing DevOps practices. In this webinar, we’ll present the findings from the IDC survey, and present a blueprint to help organizations accelerate their journey to enterprise-scale DevOps. Release Management, much like Waterfall Development, is no longer drawn out over months or sometimes years. With the advent of Agile, the goal is to release more often and as a result, be more efficient. How do we achieve these expectations when we must adhere to regulations, policies, security requirements and complex technology? DevOps is commonly the answer, but what does that mean? This session will provide an overview of some of the DevOps best practices that customers are implementing to ensure their frequent release cycles are shorter and more successful. The 2018-19 edition of the World Quality Report (WQR) discusses the trends shaping QA and testing today, and offers recommendations for addressing tomorrow’s challenges. In this webinar, we’ll present an overview of the WQR’s key findings, with a deep dive into the analysis of the responses from the Financial Services sector, which is going through a radical change in its approach to application development and quality. Driving greater velocity and agility in the delivery process is critical today. As you move code from Dev into Ops, you need to ensure that the code is not only functionally complete, but also is secure and performs as expected. With the automation of delivery, you also need to understand how the current state of Ops is relevant for the work done in Dev. Rapid and error-free delivery of features that are secure is now an expectation. Attend this webinar and learn how you can ensure security while delivering quality applications with greater velocity. Hear what is top of mind for QA and testing for IT leaders just like you. The latest edition of the World Quality Report 2018-19 (WQR) analyzes responses from 1700 CIOs and other IT Professionals in 32 countries, across ten different sectors, and discusses the trends shaping QA and testing today, along with recommendations for addressing tomorrow’s challenges. One of the key findings of the report is that for the first time, end user satisfaction is now a top priority for QA and testing. DevOps accelerates more than application delivery. It transforms business ideas into customer value by automating and orchestrating continuous delivery pipelines, to securely deliver quality software and services faster. Teams are often spread across the globe supporting both traditional and hybrid IT environments. How do you streamline the delivery pipeline while ensuring collaboration? Join us to hear ways to successfully improve your delivery pipelines across large enterprise organizations, from our experts Julian Fish and Mark Levy. SAP modernization presents a combination of business challenges and technical challenges, both of which must be overcome in order to achieve a successful transformation. For best results, the business experts and the technical experts must work together on the transformation, and in particular, when testing updates to the SAP system. Scriptless testing is the most effective way to bridge the gap between those with an intimate understanding of the business processes, and those more at home with the technical details of SAP. This webinar will explore some of the challenges of testing SAP systems, and explain how scriptless test automation, using Micro Focus Business Process Testing (BPT), allows business users to define the processes, flows and data to be tested, while automation engineers implement the automated components that form each test’s building blocks. With dozens of web browsers and thousands of mobile devices needed to validate your app, functional testing must evolve to stay on time. Without a test lab to help, running down the clock is inevitable and today's testing tools need to do more than write and maintain tests. Teams need to run tests across many browsers and devices, gather actionable insight when issues are detected, and focus their testing effort for the greatest impact. By the end of this session, you'll be able to make the most of your cross-browser testing and add some time back into your day. Join the Silk product management team as they provide an overview of the new features and functionality included in the Silk v19 release for Silk Performer, Silk Central and Silk Test. DevOps is about balancing tools, processes, and people. As teams roll out tooling to support their DevOps processes, developers are experiencing huge gains in the form of increased velocity and operational efficiencies. In some cases, though, this can come with a price in the form of reduced quality assurance. Quality is the entire team’s responsibility, but QA professionals know the processes and techniques needed to right-size testing, identify and track bugs quickly, and discover the root of a problem. This web seminar will use real-world examples to show how virtualization, cloud technologies, artificial intelligence, and analytics are converging to lower the barriers to delivering functional and performance automation at scale. According to the World Quality 2017-2018 report, 96% of respondents have adopted Agile, but a large percentage of them are also still using waterfall. One of the challenges is how to bring these two platforms together and choose the best scaled agile that fits your organization, to continuously deliver quality applications. In this webinar, Peter Vollmer (SPCT), Sridar Aladhi Venkatakrishnaiah (SPC) and Silvia Davis (SPC) will share their knowledge of the most common Scaled Agile frameworks, their nuances and tips on how to choose the right one for your needs. As Agile teams are growing exponentially, companies are looking to adapt new process and tools, to integrate, optimize and manage hybrid (Agile, Waterfall) portfolio of applications. There is a need to increase visibility and collaboration while enabling insight into their organization’s process to maintain governance, avoid compliance issues, deliver quality and optimize resource and investments. Are you getting that mobile moment? Do you know what your users are really experiencing when using your app? Do you wonder where the bad rating comes from you got after the latest release of your app? Mobile user experience is actually very complicated to catch and measure, it is multi-facetted. In this webinar we will cover the most important aspects of a 5-Star mobile user experience and how you can really measure and monitor it. In a live example we will then show you how easy it is to get it done. Security is an absolute must for any mobile application. However it is often not an integrated part of the development and testing cycle. In this webinar we will cover the principles of how to easily integrate security into development and testing of mobile apps. In a live showcase we demonstrate how easy it is to get it to work. Mobile Users don’t accept bad performance or dysfunctional applications and abandon bad apps with a wipe of their hand. Bad mobile applications are far more complex to test given the fragmentation of devices out there and different network conditions in real life that are difficult to simulate in development labs. In this webinar we cover the Micro Focus approach to these issues and provide a live showcase on how to secure a stable app that exactly does what it is supposed to do. Digital Transformation of Enterprises is going on as companies try to find ways to grow their revenues, enable the workplace of the future and at the same time reduce the cost of doing business. Technology enablers like access to stable broadband connections, proliferation of mobile devices, IoT and big data provide numberless opportunities to create new innovative offerings. In this webinar we will provide an overview on how Micro Focus Mobile Lifecycle Solutions enable enterprises to build, test, secure and monitor mobile and web applications that provide a superior user experience. The new SLA of any truly digital enterprise. Business pressures are driving many IT organizations toward faster release cadence, Lean, and more Agile-like development processes. Many groups have developed processes and practices that already work very effectively, without requiring significant change. But to succeed in a bimodal world, many customers are looking at multiple tools to support newer practices and Continuous Integration (CI). Micro Focus ALM customers already have access to the tools and capabilities to succeed.